Size does matter. 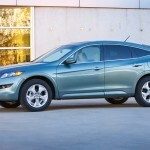 The 2013 Honda Crosstour is big enough to schlep stuff around but not the bully of the strip-mall parking lot. I admit it; I’m a station wagon gal from way back. I love a lot of space in the back of my vehicle and a touch of off-road ability, but without the gas guzzling, parking-challenged oversize M.O. of a full-fledged SUV. So for me the Honda Crosstour does the trick. My test car had the power of a V-6 engine (which is quieter and less vroomy in the Honda Crosstour than it is in the smaller Accord sedan), comfort, plenty of interior space and agile handling. There is also a four-cylinder engine available with less horsepower, but better mileage. The EX and the more luxurious EX-L models are 5-door, 5-passenger workhorses loaded with amenities like dual-zone climate control, a one-touch-to-open moon-roof and a 7-speaker 360-watt sound system. 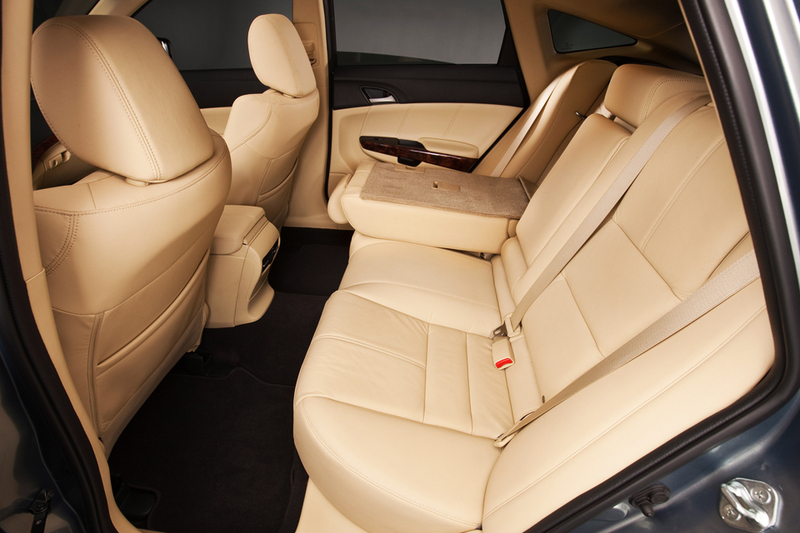 The very luxe EX-L also features leather upholstery, heated front seats, Bluetooth and an optional navigation system. And if you’re someone who notices small design details, you will appreciate the grab handles above all the doors. 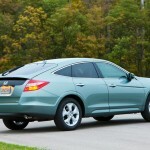 That said, I couldn’t help but feel the Honda Crosstour suffers from a vehicular identity crisis of sorts. A wider, longer and taller version of the Accord sedan with a long curved roof, it can’t seem to decide if it wants to look like a car or a crossover. But if you can live with that it’s the perfect size: Big enough, but not too big. 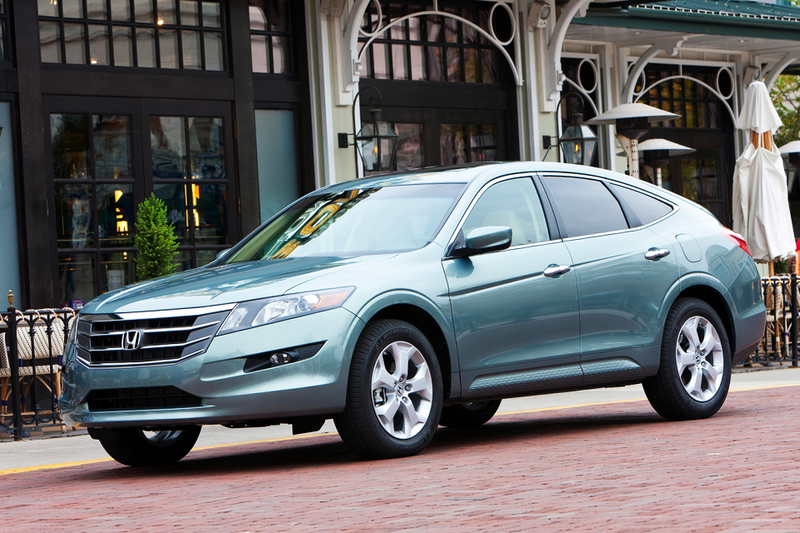 This baby is loaded with safety features, which is one of the reasons we love Hondas. One of the features we like best is the Lane Watch camera, which comes in all Crosstours except the base model. The system has a camera hidden away in the right-side mirror, and when you put your turn signal on, a monitor on the dashboard gives you a wide-angle view of the lane next to the car — an even better view than you get when you look over your right shoulder. 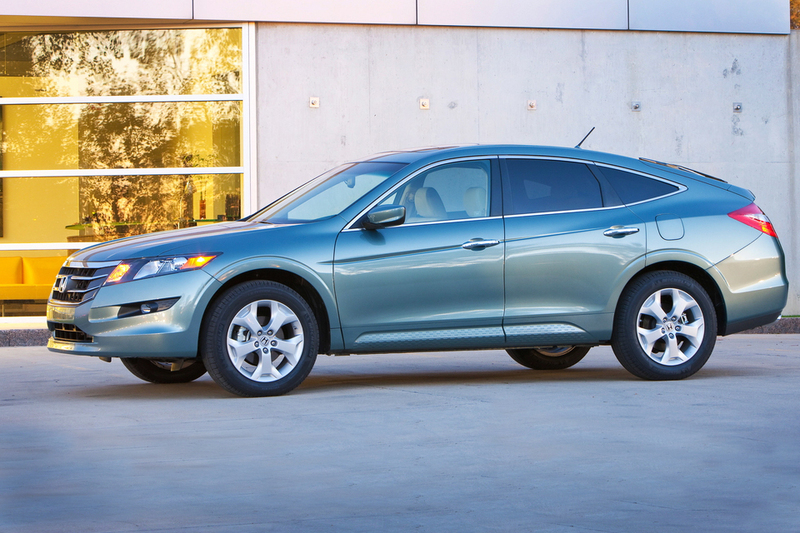 In the event of a crash, the Crosstour protects you well with six airbags. The front airbags are designed to inflate at different rates depending on the severity of the crash, whether the occupant is wearing a seat belt (which they always should do! ), and other factors. The Crosstour’s ACE (Advanced Compatibility Engineering) body structure is a Honda exclusive that keeps passengers protected by ensuring that the Crosstour’s energy-absorbing crumple zones do their job regardless of the size of vehicle it hits (or get hits by). In the event of a front-end collision it distributes crash energy throughout the vehicle and helps reduce the force of impact to the passenger as well as to other vehicles involved in the crash. 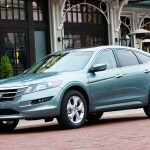 Let’s face it, the most important features when you’re transporting your family are safety and space, and we’ve covered many of the safety gizmos the 2013 Honda Crosstour features. As far as roominess goes, this vehicle offers an abundance. The rear seatback’s 60/40 split adds versatility by letting the Crosstour carry both cargo, and either one or two rear-seat passengers. 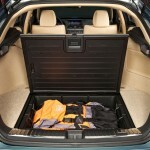 There’s a secret compartment in the back, stored underneath the floor of the trunk, which holds a large container for tools, jewelry or whatever else you want to store there; it can easily be removed and rinsed if your kid decides to store a chocolate bar in it (without telling you for six months). The Honda Crosstour outboard seats feature the LATCH (Lower Anchors and Tethers for Children), so you know your ankle-biters will be safe and won’t go flying out of the car (unless you push them!). 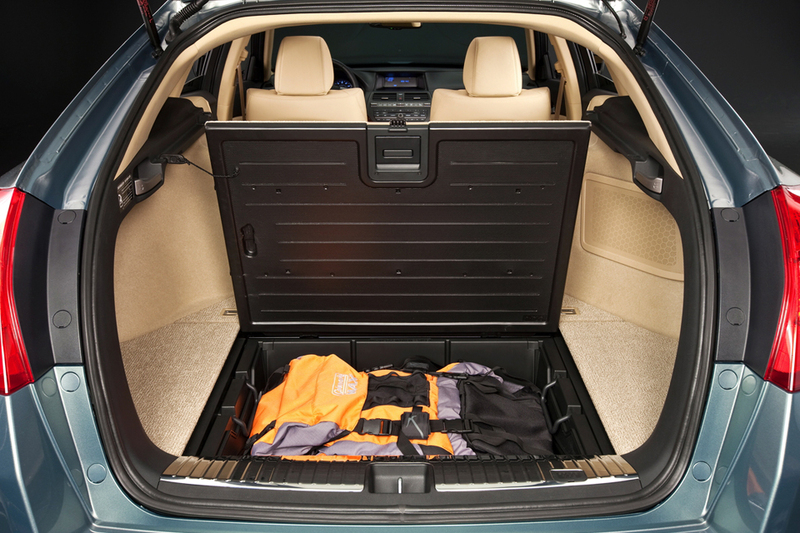 The rear hatch opens at an angle that gives terrific access to the carpeted trunk area. There’s a lot of storage here and the rear section of the floor flips up in three pieces, exposing a plastic-faced deck for muddy paws and sneakers. And finally, the Honda Crosstour navigation system is full of goodies: Maps, direction, previous destinations and Zagat’s reviews. No, there’s no ATM, but we hear that’s coming in next year’s model. 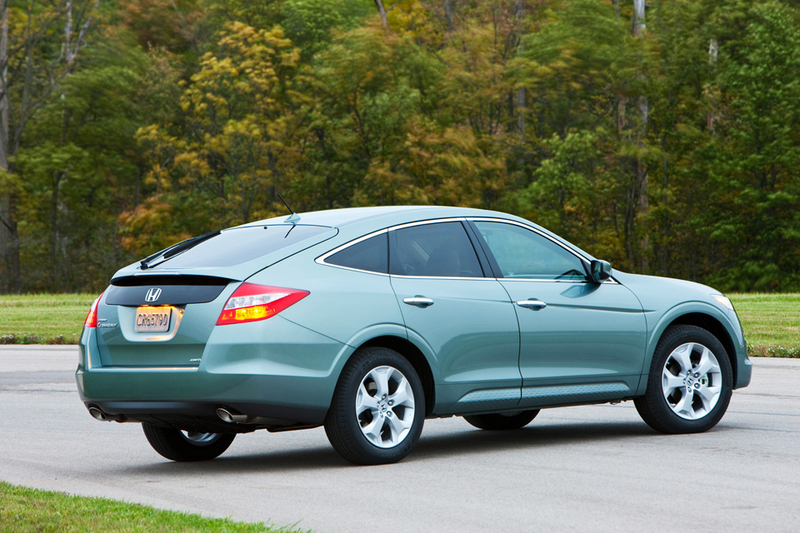 The Crosstour is sold in two trim levels, EX and EX-L, with a choice of four-cylinder or V6 power. EX models get front-wheel-drive, while the EX-L V6s is available with all-wheel-drive. An added bonus: They've lowered the prices for 2013! 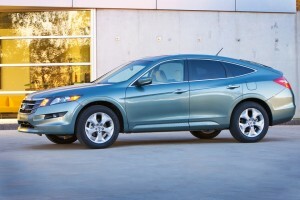 I love the way the Crosstour handles in terms of agility and easy maneuverability. But like I said, I’m a station wagon lover. It’s a crossover so don’t expect a fun ride if you’re someone who likes a little more action when you’re behind the wheel. When you shift the Crosstour EX-L into reverse the side mirrors automatically tilt down and give you a full view of the curb or parking area. Which means you don’t have to scrape against the sidewalk anymore. You can control the door locks, open the windows, and even open the moonroof, with your remote. So on a hot day you can air out the car before you get in. If you’re like me, the limited visibility through the rear window will annoy you, even make you feel a tad cloistered. Takes getting used to if you’re a driver who likes an expansive view when you look behind. Can you tell me how well 3 car seats would fit? Not sure it’s the best fit for three car seats. My suggestion is to take three car seats to dealerships when test driving vehicles you’re considering. It’s best to know fully ahead of time whether YOUR particular car seats will fit. There is no interior button to open the back….only the button under the H on the outside….there is also a LOCK button on the outside near the open button…….